Comfort food. Have you ever craved something that’s rich and satisfying but not completely unhealthy? Of course you have. But it certainly limits your choices. Well look no further. And it’s a main dish meal, too. The miraculous concoction is called bisque. Bisque is a rich, creamy soup, most often made with shellfish such as lobster, crab, shrimp or crayfish. The long and laborious way (not my way) is with a “shell” stock. It is made by simmering the shells of whatever you’re using—like making chicken stock from bones—with aromatic vegetables. The shells are often roasted beforehand for even more flavour. 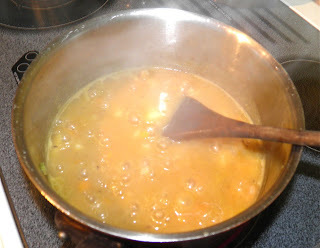 The stock is then strained, cream is added and some type of thickener. The seafood is added almost at the end of the cooking time and then all is puréed, including the seafood. My recipe leaves the seafood whole. Traditionally one of the thickeners is rice, but more often now bisque is thickened with a roux (a mixture of butter and flour which is cooked). Mine actually relies on the vegetables themselves for the thickener. That's a dietary bonus. Since I don’t make a stock for this I have added some complexity of flavour by adding vermouth. If you're interested, I have posted a recipe for homemade vermouth here. It's surprisingly easy and very good. You don’t need to buy the biggest, most expensive shrimp you can find for this recipe. Medium (or even small) shrimp work very well for this. If using small shrimp you may not even need to cut them up. Use your own judgement. 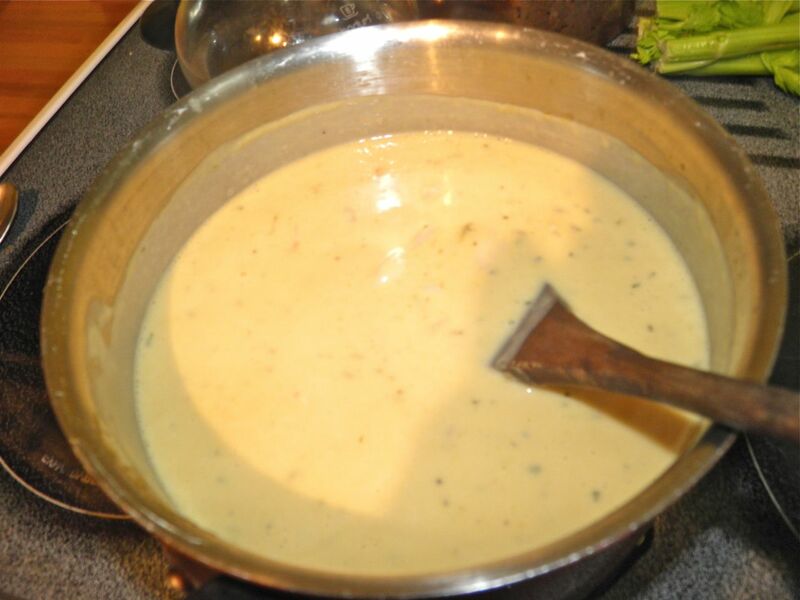 There is very little in the way of fat in this recipe, only that from the nob of butter and the evaporated milk. You could use 2% evaporated if you wish, but there’s so little in this anyway why bother. 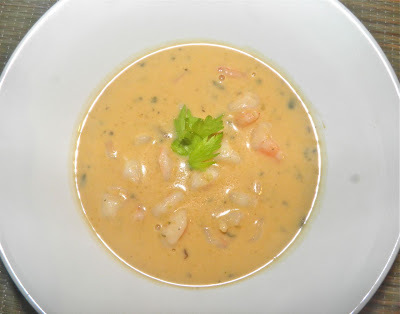 This is a wonderful simple way to use shrimp and you have the added benefit of the “fancy” name! Vermouth and evaporated milk is added. Melt the butter in a soup pot. Sauté the onion and celery until translucent. Add both types of potato, the bouillon cubes and enough water to cover the vegetables. Bring to a boil, reduce heat to medium and let cook for 15 minutes. While the potatoes are cooking, peel the shrimp and slice through into two halves. You can also dice them if you wish. Once the potatoes are cooked through remove the vegetables from the heat. 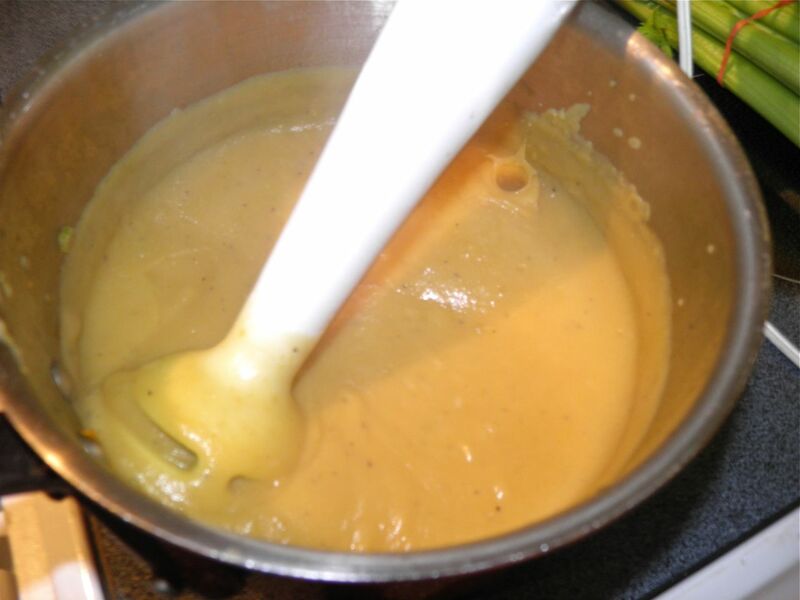 Purée the mixture with a blender or stick emulsifier until very smooth. Stir in the vermouth, tarragon, pepper and evaporated milk. I find evaporated milk works better than cream, but substitute if you would like. Then add in the shrimp. Bring to a simmer and let cook just until the shrimp are pink. Taste for salt and adjust. The amount will depend on your bouillon cubes. Some are salty, some are not. Serve with crusty rolls for a main course, or alone for a dinner party appetizer.